A fingerpicking pattern on the ‘ukulele is a clever way of “melting” a chord you already know. Sometimes strumming all the strings is more bombastic than a song requires. But you can’t just erase the harmony! However, harmony doesn’t have to be a strummed chord. A cool thing about playing the ‘ukulele is that we have two hands doing completely different things on the instrument at the same time. The fretting hand controls the notes and harmony (chords). The picking hand controls when they are sounded. Let’s focus on just the picking hand for this lesson as we learn some arpeggio patterns. The left hand can just hold your favorite chord as you practice picking with the right hand. Picking Patterns: What are They? A picking pattern is a repeating string order that your right hand picks in sequence while holding any chord. Many of these patterns intentionally target every string so the entirety of the ‘ukulele is used. For instance, a common pattern is 4231. This means you pick the 4th-string, 2nd-string, 3rd-string, then 1st-string, one after another. A pattern such as 4323 would also sound nice, but it doesn’t move quite as far across the tones of the chord. The notes of a chord played one at a time, in order, from low to high. The notes of a chord voicing played separately, in any order. A picking pattern often contains natural arpeggios, but the notes usually A. ring into each other and B. are played according to the pattern, not to the note pitch. An arpeggio usually spans many notes in order, not just the ones held in a chord shape. When you pick the strings in a pattern-like way, it begins to make much more sense to use multiple fingers instead of just the thumb. This allows for more comfortable hand positioning and speed. 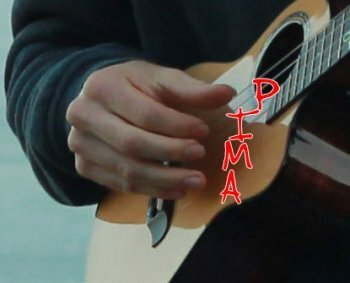 PIMA is a notation system that assigns a letter to each picking finger, leaving the pinky out. The pinky finger is unnecessary for playing ‘ukulele in this style because there are only four strings. Four strings = thumb + 3 fingers. The corresponding PIMA fingers are as follows: P = thumb, I = index, M = middle, A = ring. What follows are some fingerpicking patterns for ‘ukulele in tab format. Repeat each pattern in an endless loop for as long as needed. The suggested PIMA fingerings are shown above each note, but are certainly not the only way to play each pattern. Click here for a couple more song-specific examples. These are only a tiny fraction of all the possibilities. All the four-string combos are explored below, but with every note you add to a pattern the options multiply by huge numbers. Create your own and experiment. The main thing is to practice getting your fingers moving independently so you can just freestyle picking patterns off the top of your head. The best fingerpicking pattern is the one you can pull out of thin air. Al Wood, as always, has put together a nice collection of some patterns with video examples. The excitable Aldrine Guerrero provides some tips on creating your own patterns in his video on Ukulele Underground. Arpeggio Meditations for Ukulele is a fantastic book built around fingerpicking patterns by Daniel Ward. If you want to whip your right hand into shape, this is the material to do it.